Sestri Levante—the eastern-most extent of the Most Serene Republic of Genova. Its watchtowers face east toward Pisa, the enemy. This is Liguria, the home of pesto and perhaps of romance. LIguria attracted poets and writers, including Lord Byron, Percy Shelley, and Mary Shelley (author of Frankenstein), giving name to the Bay of Poets in nearby La Spezia. Our hotel was steeped in romantic origins. Giacomo wandered the world working on cruise ships and in top hotels. He dreamed of one day building his own hotel, using everything he had learned in his travels. He met a poor but beautiful girl, married her and started their family. He bought a piece of land on a hillside overlooking the ocean and started to build their family home. But when he saw the view from the hilltop, he realized that this should be shared with others. He decide this would instead be the site where he would finally realize his dream. Three years later he opened the Hotel Vis a Vis. It is still owned and operated today by his grandson, Nicolo. Vis a vis: face to face. The hotel is so named because it looks out over two coves: the Bay of Silence and the Bay of Fables. 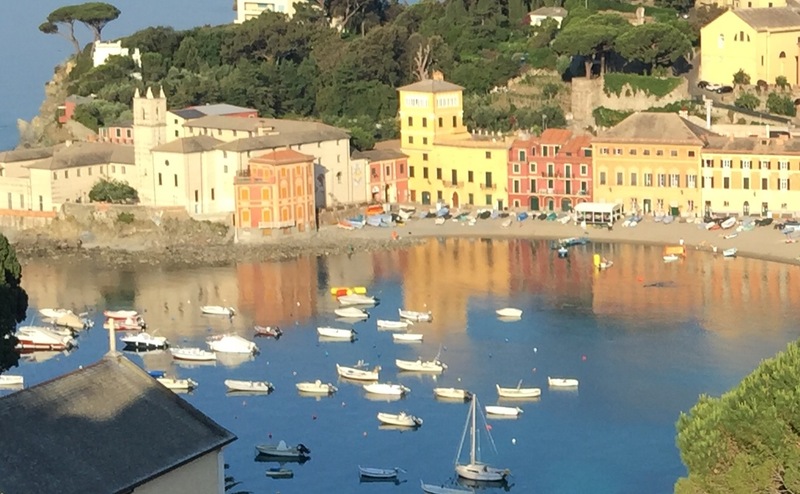 The Bay of Fables was named by Hans Christian Anderson, who lived in Sestri Levanti in 1830. The Zeus Lounge and Olympus Restaurant sit on the top floor of the hotel, If you linger there, on the open terrace, perhaps watching the sunset, with the scent of jasmine carried on the gentle ocean breeze, you might believe, as Giacomo obviously did, that you are indeed dwelling close to the gods. Intro picture is simply amazing! Sunset is close second! Your photos always seem to chase the ineffable, and come closer than I thought possible. Inspiring work! So beautifully put, Brianna. Thank you! Thank you so much, Miss Evelyn. You weave a rich tapestry with your words. Your photographs capture a rare light. Bravo! Thank you so much, Ed. That is high praise coming from an artist. And now history will add the name Nadia to list of inspired soles who stood mesmerized at this amazing view and then was moved to share it through her own words. Absolutely priceless.. Thank you for bringing this gift to us! What a beautiful comment, Niles. Thank you!